Leccinum is a genus of fungi in the family Boletaceae. It was the name given first to a series of fungi within the genus Boletus, then erected as a new genus last century. Their main distinguishing feature is the small, rigid projections (scabers) that give a rough texture to their stalks. The genus name was coined from the Italian Leccino, for a type of rough-stemmed bolete. The genus has a widespread distribution, especially in north temperate regions, and contains about 75 species. Leccinum species are generally found in the woodlands of Europe, Asia, and North America, forming ectomycorrhizal associations with trees. 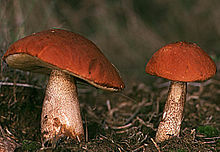 Most Leccinum species are mycorrhizal specialists, associating with trees of a single genus. Leccinum aurantiacum is an exception, however, occurring in mycorrhizal association with birch, poplar, and oak. They have generally been presumed to be edible for the most part, but there are reports of poisoning after eating as yet unidentified members of the genus in North America, even after thorough cooking. The orange- to red-capped species, including L. insigne, are suspected. Species of Leccinum often cause nausea when consumed raw. ^ "Synonymy: Leccinum Gray". Species Fungorum. CAB International. Retrieved 2015-02-08. ^ Kirk PM, Cannon PF, Minter DW, Stalpers JA (2008). Dictionary of the Fungi (10th ed.). Wallingford: CABI. p. 364. ISBN 978-0-85199-826-8. ^ den Bakker, Henk C.; Zuccarello, G. C.; Kuyper, TH. W.; Noordeloos, M. E. (2004). "Evolution and host specificity in the ectomycorrhizal genus Leccinum" (PDF). New Phytologist. 163: 201–15. doi:10.1111/j.1469-8137.2004.01090.x. Archived from the original (PDF) on 2011-07-24. ^ Beug, Michael W. (July–August 2017). "Amatoxin Mushroom Poisoning In North America 2015-2016" (PDF). The Mycophile. 54 (4): 13. Retrieved 2017-08-21. ^ Beug, Michael W.; Shaw, Marilyn; Cochran, Kenneth W. (Fall 2006). "Thirty-Plus Years of Mushroom Poisoning: Summary of the Approximately 2,000 Reports in the NAMA Case Registry" (PDF). McIlvainea. 16 (2): 47–68. Retrieved 2017-08-21. ^ Beug, Michael W. "NAMA Toxicology Committee Report for 2007: Recent Mushroom Poisonings in North America" (PDF). Retrieved 2017-08-21. ^ Takahashi H. (2007). "Five new species of the Boletaceae from Japan". Mycoscience. 48 (2): 90–9. doi:10.1007/s10267-006-0332-6p. Wikimedia Commons has media related to Leccinum. Noordeloos, Machiel. "The genus Leccinum in Western and Central Europe". Retrieved 2011-04-04. Includes key. Kuo, M. (May 2007). "The genus Leccinum". MushroomExpert.com. Retrieved 2011-04-04. Includes key to North American species. Scates, Kit; Gibson, Ian; Bishop, Richard (2004). "Trial field key to the BOLETES in the Pacific Northwest". Pacific Northwest Key Council. Retrieved 2011-04-04. Includes Leccinum species. "Leccinum Gray". Atlas of Living Australia.